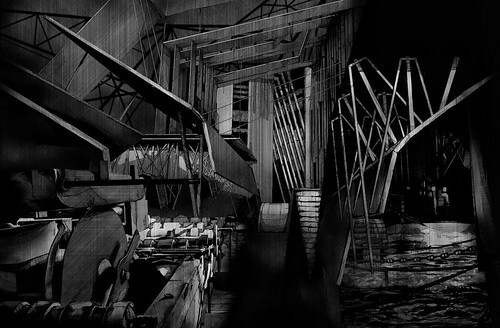 [Image: "The Dormant Workshop" by Tom Noonan, courtesy of the architect]. 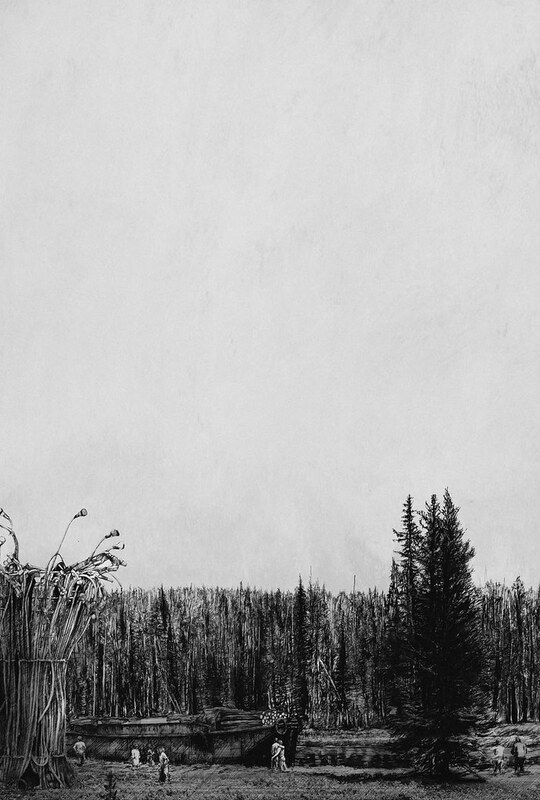 [Image: "Log Harvest 2041" by Tom Noonan, courtesy of the architect]. 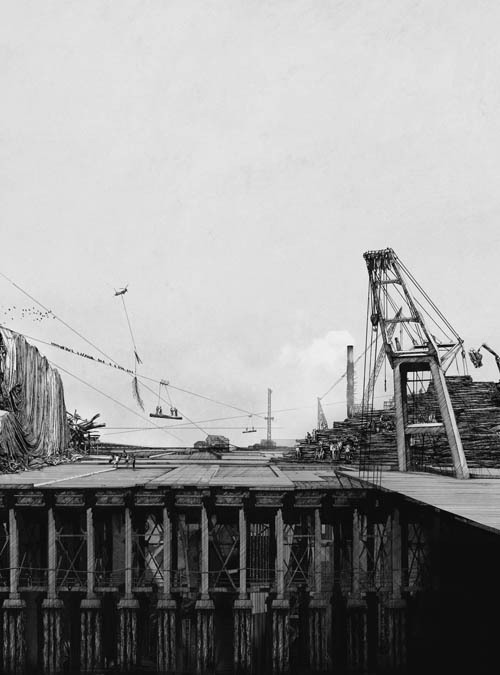 [Image: "Reforestation of the Thames Estuary" by Tom Noonan, courtesy of the architect]. The urban scenario thus outlined—imagining a "future timber and plantation industry" stretching "throughout London, and beyond"—is like something out of Roger Deakin's extraordinary book Wildwood: A Journey Through Trees (previously described here) or even After London by Richard Jeffreys. In that latter book, Jeffreys describes a thoroughly post-human London, as the ruined city is reconquered by forests, mudflats, aquatic grasses, and wild animals: "From an elevation, therefore," Jeffreys writes, "there was nothing visible but endless forest and marsh. On the level ground and plains the view was limited to a short distance, because of the thickets and the saplings which had now become young trees... By degrees the trees of the vale seemed as it were to invade and march up the hills, and, as we see in our time, in many places the downs are hidden altogether with a stunted kind of forest." Noonan, in a clearly more domesticated sense—and it would have been interesting to see a more ambitious reforestation of all of southeast England in these images—has illustrated an economically useful version of Jeffreys's eco-prophetic tale. [Image: "Lecture Preparations" by Tom Noonan, courtesy of the architect]. [Image: "Urban Nature" by Tom Noonan, courtesy of the architect]. [Image: "Timber Craft Workshop" by Tom Noonan, courtesy of the architect]. Noonan provides that, as well. He describes the Institute as "a landscape connecting Deptford with the river," not quite a building at all. It is an "architecture that does not conform to the urban timeframe. Rather, its form and occupation is dependent on the cycles of nature." 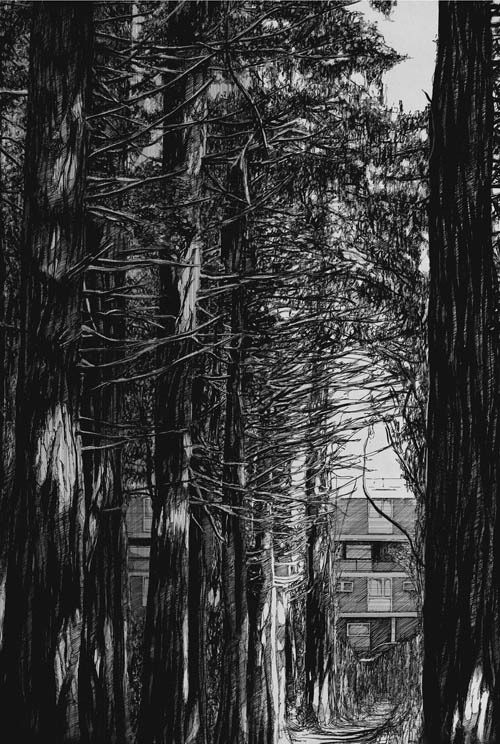 The drawings are extraordinary, and worth exploring in more detail, and—while Noonan's vision of London transformed into a working forest plantation would have benefitted from some additional documentation, such as maps*—it is a delirious one. 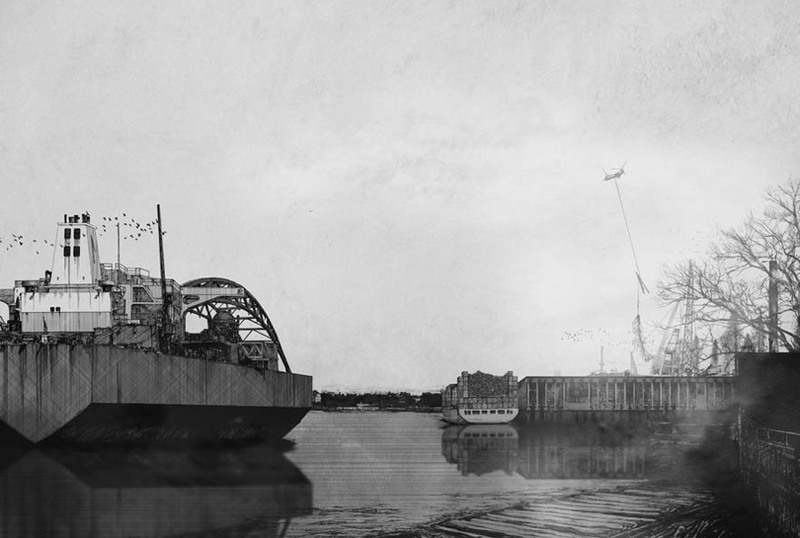 [Image: "Thames Revival" by Tom Noonan, courtesy of the architect]. Hooray for urban forestry! But we can have both via urban agro-forestry. Great post. Are there any books or websites where we can get more info on Tom's vision? Many thanks to Geoff for the post and all his great work! 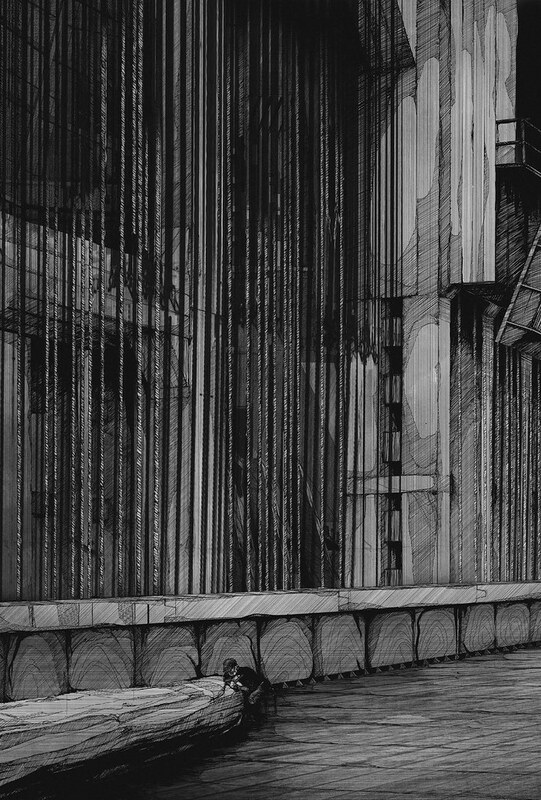 These are amazing images, and I don't want to take away from the quality of the project, but it is a bit misleading to say that these are hand drawings, when there is clearly digital layering and filtering. And I agree that some plans would be great to see. They are lovely to look at though. I've added your blog into the link of my blog, because it's so interesting! Greetings from Ardraw Cottage , less than 2 miles from the oldest Oak Forest left in Europe. Amazing drawings, congratulations from Johnny, Jo, Seamus , Mary and Hannah .